One of my greatest revelations about bird feeding over the past 20 years has been the incredible appeal of bird feeding to children like our two-year old grandson who gets a great thrill from throwing bread crumbs to pigeons near his home in Brooklyn, New York, as well as to senior citizens in their nineties who are entranced by the beauty and actions of birds coming to feeders by the windows at their retirement or assisted living homes. Feeder birds instill a lifelong passion among people with their fascinating colors, behavior, and seasonal appearances that keep bird feeding fun and interesting. One reason for the increased enjoyment people get today from feeding wild birds is the change that has occurred over the past several decades as people have transitioned from “generic” bird feeding to “targeted” bird feeding. Generic bird feeding was characterized by putting out old bread, table scraps, and waste grain for the birds and watching whatever birds showed up—typically species like Rock Pigeons, House Sparrows, European Starlings, grackles, and Brown-headed Cowbirds. I became aware of the potential for targeted bird feeding when visiting with John Barzen, CEO of Barzen International in Minneapolis, Minnesota, in the mid-1990s. He was marketing a premium line of bird foods like a “cardinal mix” that contained black oil sunflower seeds, safflower, and peanut pickouts. He said had learned that people will pay for “premium” bird food mixes that attract “premium” birds. safflower seed. Photo by Carrol L. Henderson. 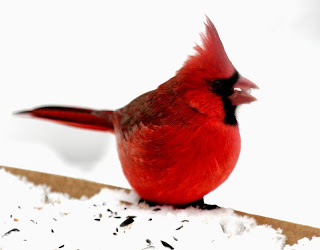 Demand was evolving for nyjer seed to attract goldfinches, Pine Siskins, and redpolls; safflower seed to bring in cardinals (while discouraging use by House Sparrows); and peanuts for woodpeckers (offered in squirrel-proof feeders). Also coming to market were starling-proof suet feeders that attracted chickadees and nuthatches and white proso millet that attracted Indigo Buntings and Painted Buntings. Black-oil sunflower seed (compared to the more traditional gray-stripe sunflower seed) turned out to be easier for smaller songbirds to crack open and, as an added benefit, had higher oil content, providing birds more energy. It was discovered to be a great attraction for Rose-breasted Grosbeaks, Evening Grosbeaks, cardinals, and other seed-eating songbirds, too. 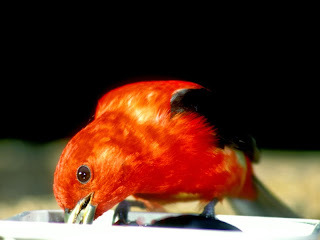 Grape jelly was found to be very attractive to orioles, catbirds, and even Scarlet Tanagers. grape jelly. Photo by Carrol L. Henderson. 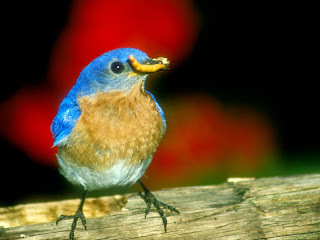 In this same era mealworms—the larvae form of the darkling beetle—were “rediscovered” to be a great food for attracting bluebirds. Mealworms are “targeted” fare for bluebirds. Photo by Carrol L. Henderson. Backyard bird feeding stations changed from an assortment of “junk foods” for birds to backyard delis that now attract beautiful and colorful birds throughout the year. 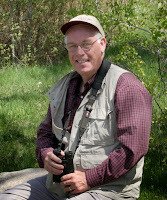 That was the other major change that has occurred with wild bird feeding over the past several decades. It used to be a hobby for the winter season when people felt birds were most stressed by the weather and needed supplemental feeding. When I first began working to promote bird feeding for the Minnesota Department ofNatural Resources, I would call bird food retailers at the end of winter and ask if they had “left-over” bird seed that they needed to dispose of so it would not get moldy over the coming spring and fall. They gave me the seed free which I distributed to Minnesota’s state parks and Department of Transportation rest areas to stock their bird feeders. Not anymore. 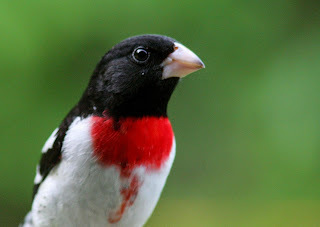 Now people have discovered the joys of year-round bird feeding and the wonderful colorful birds that come in the spring and summer like Rose-breasted Grosbeaks, Indigo Buntings, orioles, goldfinches and even Scarlet Tanagers. While delighting over the joy that people of all ages get from feeding wild birds, I have also learned of an unusual perception that some people have about bird feeding—bird feeding is an important conservation measure to save the birds. It might seem logical, but for most birds, the amount of food that most birds obtain from feeders contributes only a small portion of their total diet. Studies have shown that even for Black-capped Chickadees, which are one of the most common visitors to bird feeders, only up to about 20% of their diet is provided at bird feeders. The rest comes from seeds and insects obtained in the wild. One time I gave a talk about the wildlife conservation work of the Minnesota Department ofNatural Resources’ Nongame Wildlife Program to members of a bird club. 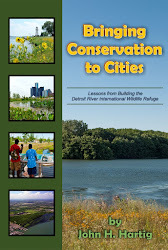 That program has been funded primarily by voluntary donations to the NongameWildlife Checkoff on Minnesota’s tax forms since 1981. After the program, a gentleman came up and said that he didn’t donate to the Nongame Wildlife Checkoff because he had spent about $200 in the past year feeding the birds so that was his contribution to help wildlife. I was so disappointed to hear of this obvious lack of interest in the work we were doing for the state’s wildlife, but I wasn’t sure how to express that disconnect between benefits of bird feeding and larger scale needs for wildlife conservation at the state and national level. Bird feeding provides supplemental nutritional benefits for birds but it is primarily a benefit for the up-close-and-personal observation of birds which creates enjoyment for people of all ages and creates a lasting bond with nature as we enjoy those “backyard” birds. However, in Minnesota, we have only about three dozen bird species that commonly come to feeders out of over 400 species that have been recorded in the state. Interestingly, most of the birds that come to feeders are among the most common and adaptable of birds—like the Black-capped Chickadee, Downy Woodpecker, White-breasted Nuthatch, European Starling, House Sparrow, Northern Cardinal, House Finch, and American Goldfinch. In the national State of the Birds Report that was issued in 2014, serious problems were identified with continuing habitat loss of forests, grasslands, and wetlands. Any serious conservation initiatives for bird conservation need to address these losses and initiate projects to restore and maintain the quality and quantity of those habitats. So my closing thought on our book, Feeding WildBirds in America: Culture, Commerce and Conservation (Texas A&M University Press), is that we have done our best to document the long and fascinating history of bird feeding traditions in America and to document what lessons we have learned on how to feed the birds—and how to conserve the birds. If you want to increase your enjoyment of the birds at your feeders, check out Chapter 14 that highlights our “Top Ten” list of bird foods and our “Top Five” Best Practices Tips for doubling the number of bird species at your feeders. And if you really love birds, help save the habitats of the forest, prairie, and wetland birds that never come to backyard bird feeders! Buy a federal “Migratory BirdHunting and Conservation Stamp” (often called the “Duck Stamp”), donate to your state “Nongame Wildlife Checkoff” or “Wildlife Diversity Checkoff” on your state tax forms, and purchase a state conservation license plate. There are some who believe that feeding hurts bird populations by concentrating them in areas where disease is more easily conveyed from sick to healthy birds, and where habitat is less than ideal. What do you think? What beautiful birds. Such great photos, they really capture their pigmented feathers.